In concrete production, because of air entraining admixtures (AEA) are used for a small percentage by weight of cement (in the range from 0.06% to 0.2%), there is a possible risk adding more admixture in concrete than calculated from personnel or equipment’s sensitivity errors. In this situation concrete’s strength and durability performances are diminishing. In this work, it was investigated the effect of high dosage air entraining admixture usage on mortar properties. It was carried out unit weight, flowability, setting time, air content, compressive strength, flexural strength, ultrasound velocity tests and microstrucural inspections on specimens which were produced with 5 different dosages including control. As a result of experiments, in case of using admixtures with overdose, there would be loss of quality of physical and mechanical properties of concrete, for this reason it is concluded that, there must be some legal regulations using chemical admixtures sensitively. TS EN 934-2+A1 Admixtures for concrete, mortar and grout - Part 2: Concrete admixtures - Definitions, requirements, conformity, marking and labelling, Turkish Standards Institution, 2013. J. Jasiczak, K. Zielinski, Effect of protein additive on properties of mortar, Cement and Concrete Composites. 28 (2006) 451–457. doi:10.1016/j.cemconcomp.2005.12.007. B. Łaźniewska-Piekarczyk, The frost resistance versus air voids parameters of high performance self compacting concrete modified by non-air-entrained admixtures, Construction and Building Materials. 48 (2013) 1209–1220. doi:10.1016/j.conbuildmat.2013.07.080. L. Du, K.J. Folliard, Mechanisms of air entrainment in concrete, Cement and Concrete Research. 35 (2005) 1463–1471. doi:10.1016/j.cemconres.2004.07.026. M. Pigeon, J. Marchand, R. Pleau, Frost resistant concrete, Construction and Building Materials. 10 (1996) 339–348. doi:10.1016/0950-0618(95)00067-4. A.H. Akca, N.Ö. Zihnioǧlu, High performance concrete under elevated temperatures, Construction and Building Materials. 44 (2013) 317–328. doi:10.1016/j.conbuildmat.2013.03.005. D.S. Zhang, Air entrainment in fresh concrete with PFA, Cement and Concrete Composites. 18 (1996) 409–416. doi:10.1016/S0958-9465(96)00033-9. M. Grantham, Advanced Concrete Technology, Elsevier, 2003. doi:10.1016/B978-075065686-3/50269-X. F. Rendell, R. Jauberthie, M. Grantham, Deteriorated Concrete: Inspection and Physicochemical Analysis, Thomas Telford Ltd, 2002. B. Łaźniewska-Piekarczyk, The methodology for assessing the impact of new generation superplasticizers on air content in self-compacting concrete, Construction and Building Materials. 53 (2014) 488–502. doi:10.1016/j.conbuildmat.2013.11.092. ISNAD TOPCU, Ilker Bekir . "Effect of High Dosage Air-Entraining Admixture Usage on Micro Concrete Properties". 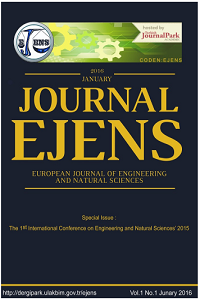 European Journal of Engineering and Natural Sciences 2 / 1 (February 2017): 1-11.